Services Web 2.0 Writing Publishing - Design and build an effective online marketing campaign and web site. WRITING & PUBLISHING Expressing yourself clearly and concisely is an art. Contract us in a FULL Service capacity or as an addition to your in-house team. I also provide EDITING Services, and Ghost Write for BLOGS & Twitter ... if outright ghostwriting isn't appropriate or ethical for your situation you can contract me to simply help you find your voice. 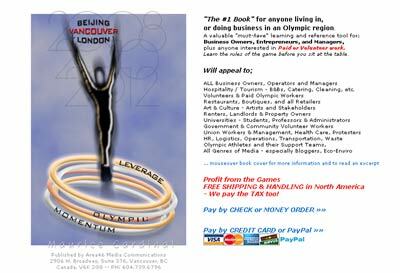 The image at left is a book project I researched, wrote, and published to help companies leverage Olympic momentum.